British heavy prog psych band BOSS KELOID have released a massive new single 'Peykruve' which is taken from their forthcoming third album Melted On The Inch, due for release via Holy Roar Records on April 27th 2018. 'Peykruve' breathes an entirely new life into BOSS KELOID's sound and had its first radio listen on BBC Radio 1 Rock Show with Daniel Carter and its online premiere via Decibel Magazine here. 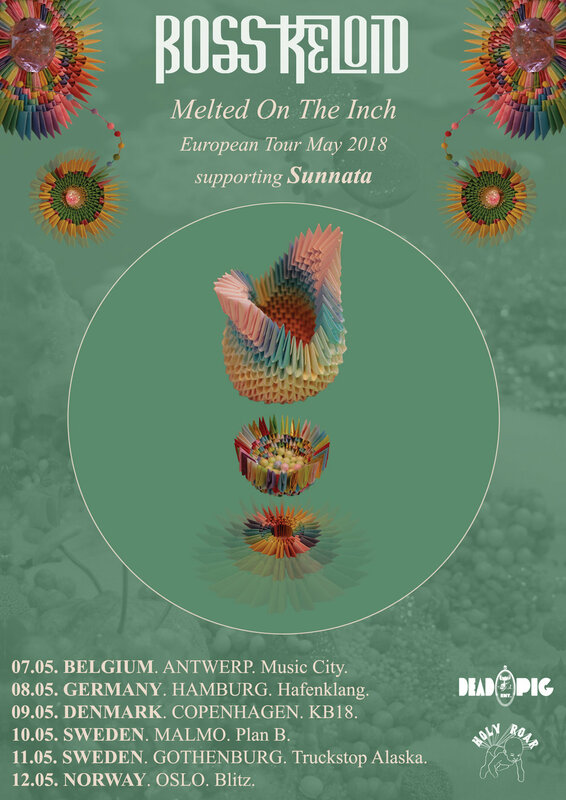 Comments guitarist Paul Swarbrick: "We're really excited to be playing these cool cities with the incredible Sunnata. We'll be playing our new album 'Melted On The Inch' in full, and it will be the first time we play any of these new songs. The shows will be the first time we've played live with Matt on keyboards and Alex (vocals) is now on second guitar duties too. They will also be the first shows with our new bassist Chid. It'll certainly be interesting to see how the Boss Keloid live experience will bring a fresh dynamic."